Fourth-generation funeral director earns national award for young funeral home professionals. 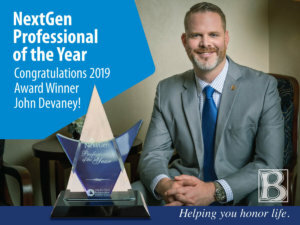 We are pleased to announce that fourth-generation funeral director and VP of Funeral Services John Baue Devaney has been named the 2019 NextGen Professional of the Year Award, an honor bestowed by the national trade organization Selected Independent Funeral Homes. Each year, Selected Independent Funeral Homes carefully vets funeral home professionals under the age of 50 from all over the country; one winner is selected based on his or hers career accomplishments and community involvement. This year, John arose as the clear winner due to his demonstrated leadership and active role in the St. Charles community. “What makes John stand out from other successful next generation leaders is his community involvement. To lead a successful organization takes hard work and dedication. Actively engaging this same philosophy into the community is something to admire,” said Milva Finnegan, Contracts Manager & CEO of Karhu LLC. John entered our family business as an apprentice funeral director and worked his way up to VP of Funeral Services. He attained his MBA while balancing full-time employment and a growing family. Today, John uses his business savvy to continue building the Baue legacy. “John understands the stress of this job and the support our team needs to provide the absolute best care to families. That’s why he organizes regular employee outings and has added private break rooms for staff members to relax and recharge. We are so proud of him—and I know his grandfather, David C. Baue, would be proud of him as well,” Lisa Baue, CEO of Baue Funeral Homes, Crematory and Cemetery. Watch as Lisa and John talk about the legacy of Baue, take tour of our locations or meet our caring staff.